The idea of swimming in any of New York City’s notoriously filthy rivers is likely to leave most of the city’s residents feeling the same way—incredulous, and probably a little nauseated. But Heineken and Tribeca Studios (the production arm of Tribeca Enterprises) are looking to drum up more support for a floating—and heavily filtered—public pool in the city’s most local waters, with a pair of new videos narrated by Neil Patrick Harris. The pool itself is not a new proposition: Shaped like a plus sign, and aptly named “Plus Pool,” it’s the brainchild of a handful of local architects and designers, who have been spearheading stress-testing and fundraising for the project since 2010. One of the clips, directed by Bianca Giaever of Greenpoint- and Los Angeles-based production company m ss ng p eces, walks viewers through that story, as told by Harris and various stakeholders and advisers, like co-founder Archie Lee Coates IV and Joshua David, one of the founders of New York City’s High Line park—another improbable public project, and one that ultimately became reality. The pool, though, is still far from a sure thing. Its founders are still hashing out a location with local officials and working on gathering investors to provide the $20 million it will take to build. Heineken, for its part, is promising $100,000 in funds to the project, but only if 100,000 fans of the idea sign a petition supporting it. “We want people to demand they get Plus Pool,” says Quinn Kilbury, senior director of marketing at the brewer, who has overseen other projects in its in-house, metropolitan-improvement “Cities of the World” campaign—like the “Subway Symphony” collaboration with James Murphy of LCD Soundsystem. (Side note: Kilbury also led the creation of 2014’s best ad—Anna Kendrick’s foul-mouthed Super Bowl hijacking for Newcastle Brown Ale—while working at that Heineken subsidiary). The second new clip, a VR video directed Ray Tintori (also of m ss ng p eces), offers a rendering of how the pool might look if it were nestled between the Brooklyn and Manhattan bridges off Brooklyn Bridge Park in Brooklyn’s Dumbo neighborhood. “Heineken has given us the ability to speak to an audience much bigger than the audience that we have currently,” says Coates. So far, the brewer’s petition, found at swimintheriver.com, has racked up about 5,000 signatures since the brand’s partnership with the pool first hit the press in late April. 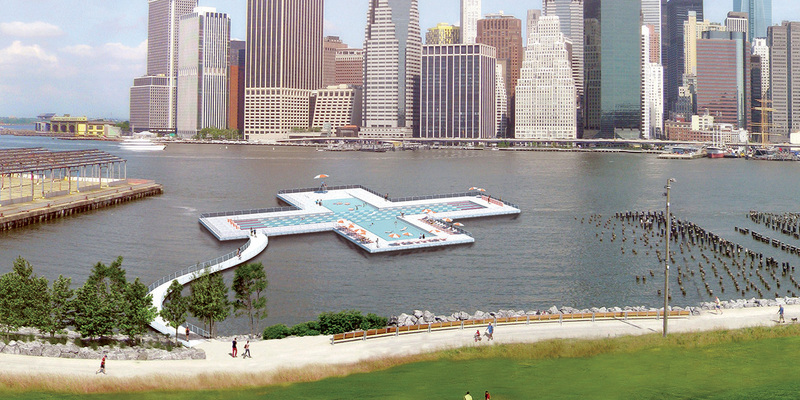 Hopefully, 95,000 more are willing to jump on board soon, because until it’s built, some New York teens will probably just keep taking dips in the Hudson anyway—as an extraordinarily ill-advised rite of passage.